The Links to the individual tracks will open up a new window with the relevant track on WIKILOCS. To download a specific track you must register (or log on, if you already have an account with WIKILOCS). Disclaimer: We make no warranty with regard to the accuracy or safety of the published tracks and waypoints ("Locations"). 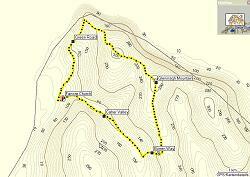 For hiking we recommend to take additional local maps and to use proper equipment. Spectacular coastal and sea views. Track can also be joined from the Kilkee Side via the N67 or Waypoint "Intersection", from Kilkee add ~3kms to the track length.Length: 30 kms, 3 hrs. Easy-to-drive circuit to explore the Doonbeg Area. Mostly on quiet country lanes through Boglands and near the coast with views on Atlantic up to the Cliffs of Moher. Includes a visit to Doughmore Beach. Not suitable for racing bicycles! Length: 27.3 kms, 2.5-3.5 hrs. Easy-to-drive circuit to explore the Doonbeg Area. Mostly on quiet country lanes through Boglands and near the coast with views on Atlantic up to the Cliffs of Moher. Includes a visit to Doughmore Beach. Not suitable for racing bicycles! Length: 25.2 kms, 2-3 hrs. This track is a shorter, more family friendly version of north clare bicycle loop no.4 (originally from Doolin) but starts and ends in Kilfenora. Quiet roads, nice Burren scenery. Highlight is little visited Noughaval Church, one of the earliest christian monuments of the Burren. Lots of good parking opportunities in Kilfenora. Length: 23 kms, 2-3 hrs. Loop track in lovely landscape of Mid Clare, following in parts the walking route Mid Clare Way. Most of the route is paved, except for 1 km which follows a narrow foot path, where you might have to get off the bike. Starts and ends in Connolly, good parking opportunities at the church and at a convenience shop nearby. Length: 28 kms, 2-3 hrs. Spectacular coastal track, one of the finest in Ireland. Fantastic cliff scenery, seabirds breeding, chance of observing dolphins. This walk can be combined with the track "Whitestrand to Blue Pool" (18km total, 6 hrs.) WARNING: Not to be walked in wet conditions nor with children. Along the edge of high cliffs, also involves climbing fences. In no case climb down the rocks to swim in the rock pools or for angling. Dangerous high waves rolling in regularly. Use extreme caution on this track and watch your steps! Trespassing private property, leave nothing but your footsteps and stay clear of cattle and horses. Length: 9.8 kms, 3 hrs. Easy loop walk for the whole family, part of the rather quiet Mid Clare Walkway. This track winds mostly through forest, beautiful views on Clare countryside in between. Length 5.2 km, 1 hr - 1 hr 30 mins. This difficult but very rewarding walk follows the blue marked trail on and around the mountain with the addition of an adventurous alternative. Though leading through some rough terrain you may expect unusual rock formations and fossils which you don't find anywhere else in the Burren. Use extreme caution on the whole track and watch your step. Finish the experience with a tea & scones in Father Ted's House, nearby. Length: 6.6 kms, 3 hrs. A wonderful circuit to explore the limestone landscape of the Burren! Features splendid views on Galway Bay and ancient monuments. Starts at Fanore Church and can be done in both directions. Requires constant attention to avoid stepping into one of the numerous fissures! Length: 14.2 kms, 4-5 hrs. Download GPX Track here (1. Right click on "download" 2. Click on ("save linked content/target as...") 3. Download (depending on your browser it will either be saved as a .xml file or as a .gpx file) 4. Open the file with Mapsource , G7towin or similar programs to upload it to your navigational device.